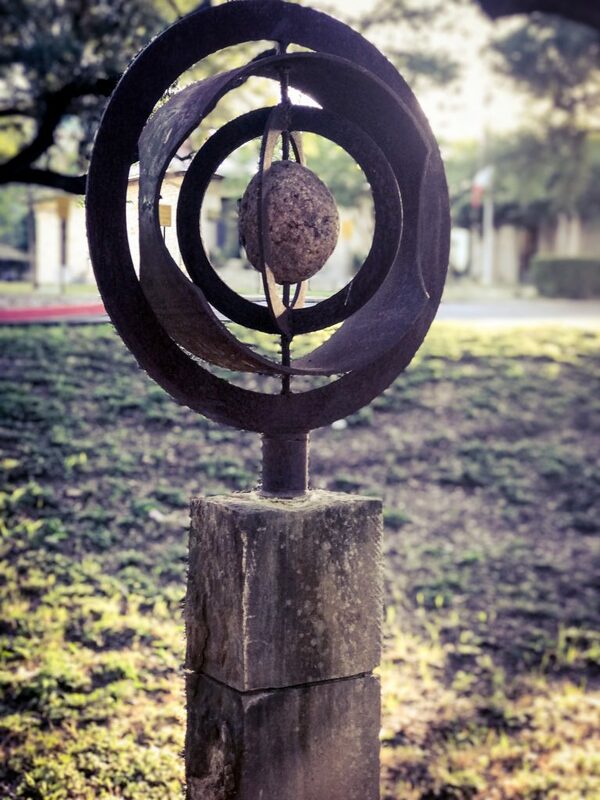 Symbolism is the essence of my sculpture, it is simple yet expressive. It combines geometric and freeform shapes, but the circle is the encompassing factor and provides a focal point for the observer. The circle frames a combination of symbolic shapes to capture and direct the sun’s rays and create moving shadow patterns; light and shade to please and tease the eye in concert with the passing hours of the day. Doyle sees the circle as representing life from beginning to end, a symbol of wholeness, completeness and unity. For some it may represent perfection, worthiness and aptness with the family. It is often seen and used as a means of centering oneself to collect thought and focus on the inner-self. Doyle does not often name his works, he feels the person who buys his pieces should name it based on what they see and feel. Doyle Morgan Fellers has been a part of the art and music world for many years. His creative talents as a sculptor, painter, poet and musician have been expressed in many ways. After graduating from Texas State University, where he received scholarships in both music and art, he used his skills, as a graphic designer and writer to create a major marketing communications firm in Austin. Since retirement, he has focused on art and poetry, and his sculpture and paintings are part of numerous art collections. In 2008 he was named Poet Laureate by the City of Dripping Springs and has authored two books of poetry. Several of his poems have been adapted to lyrics and recorded. His studio and workshop are located just outside of Dripping Springs where he maintains a sculpture garden to share and display his work and well as that of other sculptors. Heart of Venus: The price is $3,500, a portion of the proceeds will be donated to The Bee Cave Arts Foundation.